Antony Hook – the Liberal Democrat MEP candidate for the South East of England this week tweeted this picture. 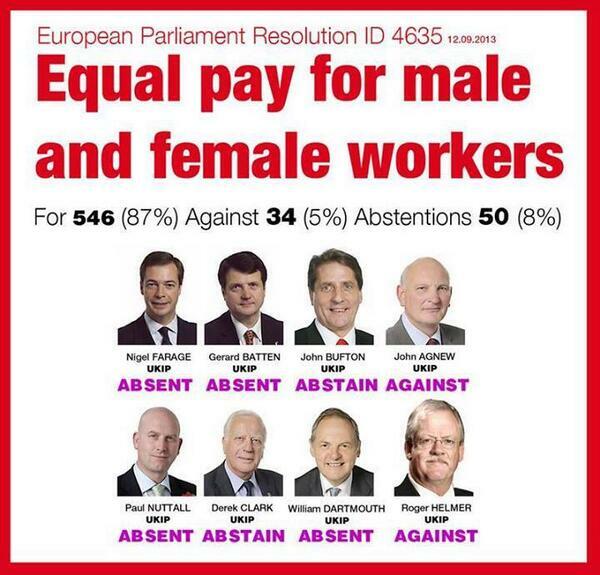 Rightly, he points out that UKIP MEPs were either absent or voted against a European Parliament motion calling for the equal pay of male and female workers. This motion received a massive 87% support from across the political spectrum but not from UKIP. What Antony Hook might not have realised though is that his Liberal Democrat colleague George Lyon also voted against the motion alongside two other ALDE MEPs. I look forward to his infographic highlighting this. Shame on any MEP who voted against this motion…Lib Dem, UKIP or Tory (note no Labour or Green MEPs voted against the motion)!